I've been involved in beauty pageants for about 14 years, as a contestant, a coach, a director's assistant, a judge, a spokesperson, an interviewer and a titleholder. Therefore, I know a lot about beauty pageants. I’ve also been called the “Master Interviewer” when it comes to pageants and interviews in general. I’ve studied, researched, interviewed others, read dozens of books on interviewing and if I may say so myself, I interview very well when I’m prepared with pageant questions in advance. This Pageant Interview Questions for Children eBook contains 100 Advanced Pageant Interview Questions And Answers that your child may be asked during their next pageant interview. However, this time, your child doesn't have to be nervous about what questions may be asked, because they'll be armed with some example answers that they can use! I wrote this eBook because I realized that often-times children get really nervous before the pageant interview because they are worried about the questions they might be asked. They wonder if they’ll answer them correctly, stutter while giving the answer or draw a complete blank during the interview all together. Well parents and kids, you don’t have to stress anymore! These 100 Pageant Interview Questions and Answers will help you to master any type of question that may be asked of you. These are some of the most advanced practice questions and answers that you’ll come across. Master these and you’ll definitely be prepared to win the crown or even win best interview. There are also 10 Interview Bonus Tips at the end of this eBook Plus more questions and answers, which will help you during the interview process as well. Sometimes, contestants don’t realize that the little things can make or break their interview score. Just think, if your child knew some of these little things, they could be so much better prepared before the interview and be able to relax going in, unlike the other contestants. This Pageant Interview Questions For Children With Answers eBook is for those contestants competing in Children's Pageants. This eBook is written for any Natural, Semi-Glitz or Full Glitz Pageant System. Questions, answers and tips in this eBook can also be used to prepare your child for a Preliminary, Local, State or National Pageant Competition that has an Interview portion of the pageant. Don’t let your child go to their next Pageant Interview Unprepared! 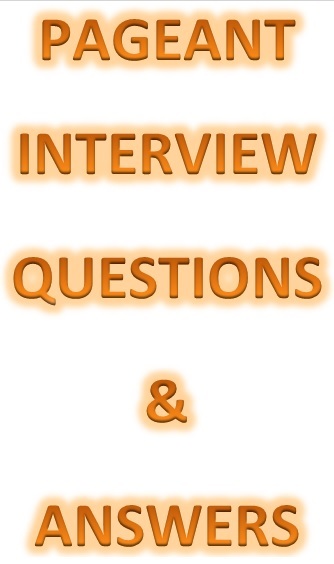 10 Pageant Interview Tips and MORE Pageant Interview Questions with Answers! *We would like you to be happy with your purchase. However, before placing your order, please read our terms regarding our Returns and Cancellation Policy relating to digital products.